^ Murray, Lorraine (2 November 2009). "Koro Sea". Encyclopædia Britannica. Encyclopædia Britannica, Inc. Retrieved 8 September 2013. Hocart, Arthur Maurice (1915). 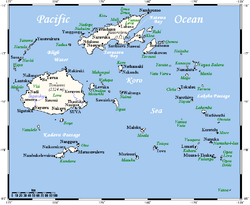 "Ethnographical sketch of Fiji". Man. Royal Anthropological Institute of Great Britain and Ireland. 15: 76–77. doi:10.2307/2788875. JSTOR 2788875. Retrieved 8 September 2013.